Comet 67P is full of surprises, from complex organic molecules to miniature space weather systems. Now, in an astronomical first, scientists have discovered molecular oxygen in the space rock’s tenuous atmosphere. And it may be a relic from the birth of the Solar System. The discovery marks the very first time astronomers have detected molecular oxygen in a coma, the cloud of dust and gas surrounding a comet. That in itself is notable. But here’s where things get really cool: Scientists have been tracking the oxygen levels in 67P’s coma since last September, using Rosetta’s mass spectrometer. Oxygen concentrations have held steady, at just shy of 4%. 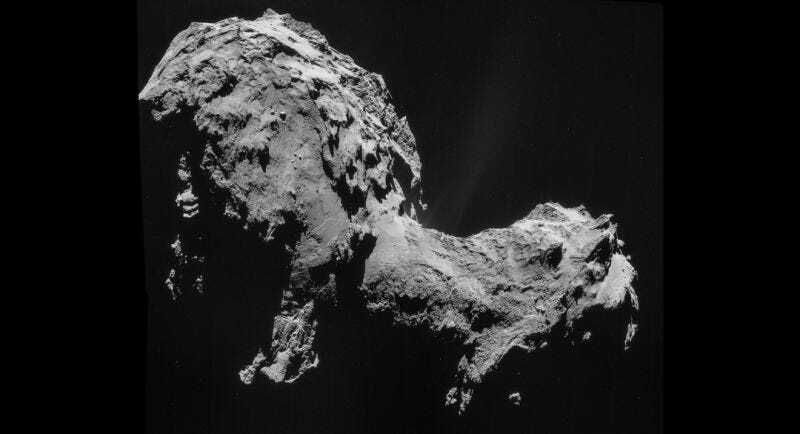 That’s despite the fact that 67P has been hurling toward the Sun, burning up and losing gas as it goes. That free-floating oxygen should be going the way off all other cometary ingredients; dissipating into the cosmic void. Unless, that is, there’s an interior source of molecular oxygen replenishing the coma as 67P sails through space. That’s the hypothesis outlined in the new Nature paper. And if there’s molecular oxygen in the center of the comet, it’s almost certainly “primordial.” It’s been there since 67P formed, which is to say, since the formation of the Solar System itself. Ultraviolet light from the sun and free-range electrons are probably responsible for creating the O2 in the first place. High-energy photons and particles can zap water molecules, which in turn reform into molecules of oxygen (and hydrogen). The oxygen was then trapped within ice that collected on dust grains, which in turn came together to assemble the comet. There the oxygen stayed protected for nearly the age of the solar system. As recently as 1840, comet 67P was far enough out in the solar system to escape the sun’s destructive influence, but an encounter with Jupiter nudged it in closer. With each close approach to the sun, heat reaches into the comet, sublimates the ice, and liberates the O2. Rosetta’s comet may be bleeding oxygen that’s as old as the Sun. An actual time capsule, spewing astro-paleontological history right onto our instruments. I can’t wait to see what we discover next.